You never quite know what you’re going to discover in the ‘Amazon Recommends’ section at the bottom of every Kindle title page; there will be several rows of books that Amazon claims are related, in some esoteric fashion, to the title you just looked at or purchased, but how those algorithms actually function is something of a mystery. I may download a horror or sci-fi title and be presented with titles that are by the same author, or obviously within the same broad genre; alternatively, I may suddenly be presented with page after page of Regency-era period romance dramas. And that’s not even considering whether I’ll instead just be presented with Amazon’s ‘Sponsored Reads’ programme and I’ll only find self-help books and random non-fiction titles. So I can only regard it as a minor miracle that the Amazon pages for The Hillbilly Moonshine Massacre and Lesser Swamp-Gods of Little Dixie by author Jonathan Raab (and editor of Muzzleland Press, publisher of high-quality weird horror) actually showcased something useful rather than the usual random assortment of titles. Likely linked by author, I saw the rather unusual and distinctive cover art for Letters of Decline, a short horror anthology edited by Tom Breen and containing stories by several Muzzleland Press authors, including Raab and author Matthew M. Bartlett. The cover illustration is certainly one of the most eye-catching ones I’ve come across in the genre; I can only really describe it as ‘If Edvard Munch had painted The Scream while working in a corporate environment’, with three figures reminiscent of the character from that famous painting seated around a table examining some kind of job application or CV. For this is not just a weird horror anthology, but one based around that most horrifying and soul-destroying process in the job market – the job interview. I’ve been in enough jobs to have had the misfortune to be on both sides of the interview table, and as such can readily certainly testify to the stressful, misery-inducing nature of the entire process. As such my interest was readily piqued by the idea of a horror anthology based around that experience, especially when the authors involved came from the same part of the genre as Muzzleland Press and the distinctly high pedigree that Jonathan Raab has developed over a very short period of time. Only adding to the positives was the fact that the anthology was available on Kindle Unlimited – a real boon to a reviewer such as myself on a very tight budget – and also permanently 99p (as of time of writing). Having downloaded the anthology, I dived in and braced myself for multiple doses of weird and bizarre horror fiction based around job interviews. The anthology opens with An Office Manager at Orford Mills by author Joseph Pastula, and Mr Pastula gives us an intense and mind-bending tale of corporate blandness and the terrifying surreality of having to conduct interviews for a position that the protagonist doesn’t know the details about, and for which none of the prospective candidates seem even vaguely capable of handling in any manner. Having interviews just dumped on you is always an unnerving experience at the best of times, and Pastula deftly replicates that feeling, as well as cleverly ramping up the general tendency of mega-corporations to compartmentalise information and only tell their workers the very minimum that they need to know in order to function. 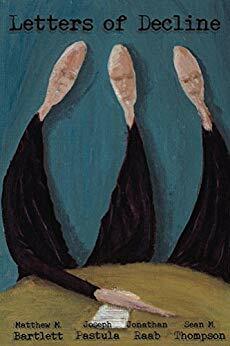 Pastula easily gets across the surreal nature of the interviews as they begin, and the bizarre nature of the interviewer and interviewees makes for some strange but highly engaging and even occasionally humorous reading as the plot progresses. But Pastula also quietly and subtly integrates horror elements, including the absurdity of nonsensical bureaucratic paperwork, and the interviewees get more and more horrifying as each interview takes place. The ending was strange but oddly appropriate, and in certain ways reminded me of the ending to Orwell’s 1984: after becoming so desensitized to the corporate bureaucratic process, the protagonist’s worldview had become so detached and desensitized that he became consumed by the job role and no longer questioned anything about the entire process. The Storefront Manager from the pen of Matthew M. Bartlett continued the surreal theme of the opening story, to the extent that I have to admit that I’m still somewhat baffled by the course of the story and what actually happens, though in a very positive way. After a fantastically eerie and unsettling opening, with a protagonist who appears to be haunted by a strange and horrifying street performer of some kind, Bartlett weaves a story that seems to descend into outright insanity, to the point where describing it feels entirely inadequate; it really does have to be read in full to be truly appreciated. Is it actually the tale of a man seeking a job in an occult theatrical company, or is that just a thin veneer to disguise a man in the throes of a rapid and comprehensive mental breakdown? I still have no idea, months after finishing the anthology, but I loved the disturbing atmosphere that Bartlett evokes, the surreal nature of the theatre and its owner, and the delicious ambiguity that runs through the entire story. We then come to the third of four stories, Cat’s Claw, LLC by , which is by far the shortest story in the anthology. As a result, it feels like writing anything about the story would be to comprehensively spoil the plot and the time and effort that Thompson has clearly put into the tale. It’s another tale of a strange and fantastical job interview for a very odd and secretive company; it’s an offer of a lifetime for the protagonist, even after finding out the rather unique nature of her employers, and I must admit I laughed out loud when their secret is revealed. This story felt like the natural start for a wider series, and I’d be intrigued to see what Thompson could do with it as a writing prompt. Finally, we come to the last story in the anthology, and the one I was anticipating most of all – A Capable Man by Jonathan Raab. To me, Raab is one of the new generation of horror writers leading the way for the genre, alongside others such as Matt Hayward and J.R. Hamantaschen; he has his finger firmly on the pulse of weird horror, and is perhaps the best writer in that subgenre. A Capable Man is excellent evidence for my assertion, it being a sublime piece of weird horror, with a surreal and and unsettling atmosphere mixed with the dark, biting and slightly sardonic humour that I’ve come to expect from Raab’s works. A new campus comes to Orford Parish, immediately attracting a horde of job applicants, including our protagonist, but as time moves on and the campus is built, strange things begin to emerge about the campus, its occupants and the corporation running it. The buildings and surrounding area are covered in a strange mist, and everything seems dilapidated and poorly maintained, especially given how new it is; and there’s also the matter of the strange-looking ‘corporate men’ that Raab describes as distinctly bland yet unsettlingly sinister at the same time. Once we enter the campus, we encounter a cast of mysterious and oddball characters, and a job interview that can best be described as ‘intense and twisted’ that leads to a job that takes a sharp left-turn into a form of body horror mixed with corporate conspiracy theories. It’s a really well-paced and finely balanced story, and a hell of a ride that pulls you along with its imagination and bizarre twists and turns, as well some very dark and grimly humorous observations. It all comes together to create a delightfully confusing and paranoiac atmosphere, with an ending that once again is incredibly difficult to actually explain; ambiguous doesn’t even begin to cover it, and yet I want to read so much more from this particular universe, especially as there are some subtle links to Raab’s characters and places from his other titles. Letters of Decline only features four short stories, making it one of the shortest anthologies I’ve ever come across in any genre I’ve read, and as a result it doesn’t overstay its due; it’s a short, sharp and above all-else deeply nuanced collection of weird horror fiction based around the concept of the job interview, and I absolutely loved every second of reading it, even if I didn’t quite know what was going on at times. All four tales have been written by horror authors at the very top of their game, demonstrating excellent writing, vivid and chaotic imaginations, and an innate understanding of just what is so horrifying and nauseating about the job interview process as a whole. Not only do these stories successfully capture the surreal and often deeply unsettling nature of interviews, on both sides of the process, they also use the trope of interviews to probe the state of human nature and the need for people to conform and to fit in. Ultimately Letters of Decline is a unique blend of weird horror, conspiracy theories and cutting satire of the bland and soulless nature of the corporate mindset that is a must-read for fans of strange, weird and unsettling horror,and for anyone that has worked in even a mid-sized corporate body.